Introduction: Business communities in the 1930s were worried about the New Deal’s economic strategies because it would be taxing the rich. Since a majority of the public was becoming aware of the Public Relations industry, businesses thought that it would be much tougher to shape the public opinion. The New Deal encouraged businesses to find the “surest route to safe guard the well-being of society” (page 296). Edward Bernays, Ivy Lee, and Carl Byoir were just some of the PR people who became prominent during this time period. 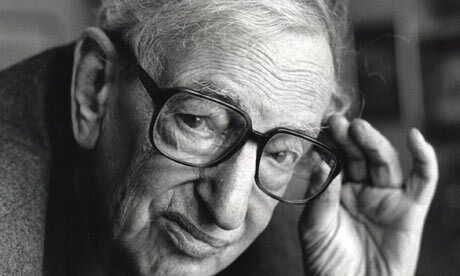 Eric Hobsbawm (lower right) argued that the Great Depression, “posed an emergency for world capitalism that appeared to imperil its survival as an economic system. National Associations of Manufacturers (N.A.M.) was created in order to win the public’s approval for large businesses that were being threatened by the New Deal. It was created in January 1895, and they were also known as the “conservative voice” for business. Not to mention, they also cared more about the public. On page 303 N.A.M. was basically described as a “public sentiment.” With it, “nothing can fail,” but “without it nothing can succeed.” With that said, the National Associations of Manufacturers was looked upon as a strong core that was needed in the economy. N.A.M. also made a pamphlet (“What is Your American System All About?”) that was based on the advertisement produced for the “American Way” campaign in 1936. The pamphlet was made to discuss the “two kinds of government” (page 305). 1.) Would “project images of the future in which capitalist industry, not government, was positioned as the motor force of the change” (page 308). Many believed that “socialization” was on the way. For this to happen, they wanted local merchants and corporate memberships to join N.A.M. so they could strengthen their public relation tactics. They wanted to show the young generation that “opportunity is not gone” (page 308). 3.) N.A.M. also took advantage of as much national media as possible (motion pictures, slideshows, radio, newspapers etc.) because they wanted the public to favor the corporations. They needed to do this so that they would be able to compete with FDR’S New Deal. Special CPI’s were also made to check newspapers for positive feedback. N.A.M. did not want negative feedback circulating around the nation. N.A.M. also pursued strategies for dealing with the press. 4.) Out of these three goals, the most important objective was to battle the idea of the future for PR. Jay Timmons (Executive Vice President & CEO of N.A.M.) talks energy, the economy, and the cost of labor. William Bird stated that during the late 1930s, “the propaganda of American business increasingly moved from a ‘rhetorical’ to a ‘dramatic’ phase. NAM’s (National Association of Manufacturers) began the format of situation comedy and drama. This was achieved through family dramas. Communication became more personal and NAM focused on telling the business’s story through current social issues in the drama that people could relate to and understand. “The American Family Robinson” was a 15 minute weekly radio show that NAM produced which provided listeners with family life and humor against industry principles. 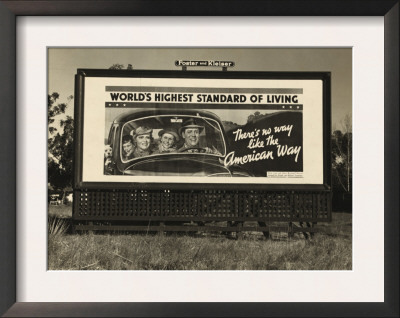 NAM also produced popular billboards such as “There’s No Way like the American Way” and “What’s good for Industry Is Good for You” which were funded by the Outdoor Advertising Agencies group. 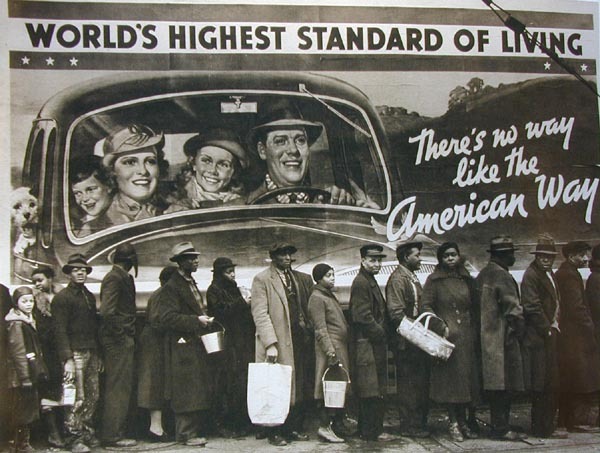 Others included slogans such as “World’s Shortest Working Hours” and “World’s Highest Standard of Living” which included pictures of stereotypical happy American families living the so-called “American dream” in a safe and happy economic system. 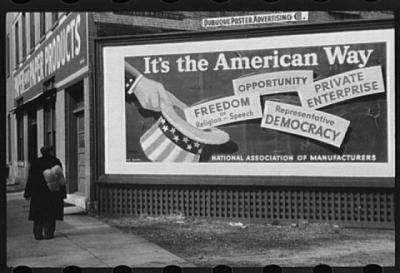 By 1938, any location in the United States with a population greater than 2,500 had one of these signs displayed. 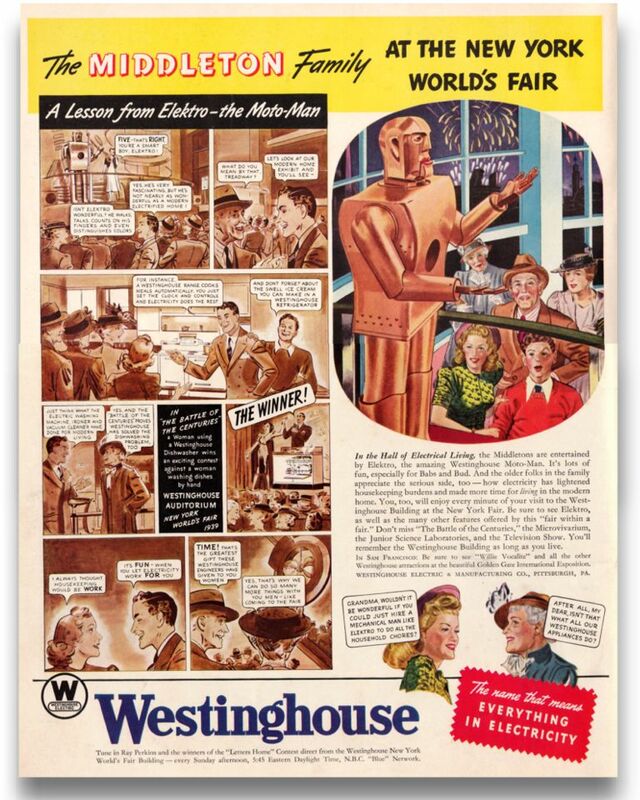 The 1939 New York World’s Fair: The World of Tomorrow caused tension from change which allowed corporations to respond to political hazards and to the publicity of the New Deal. 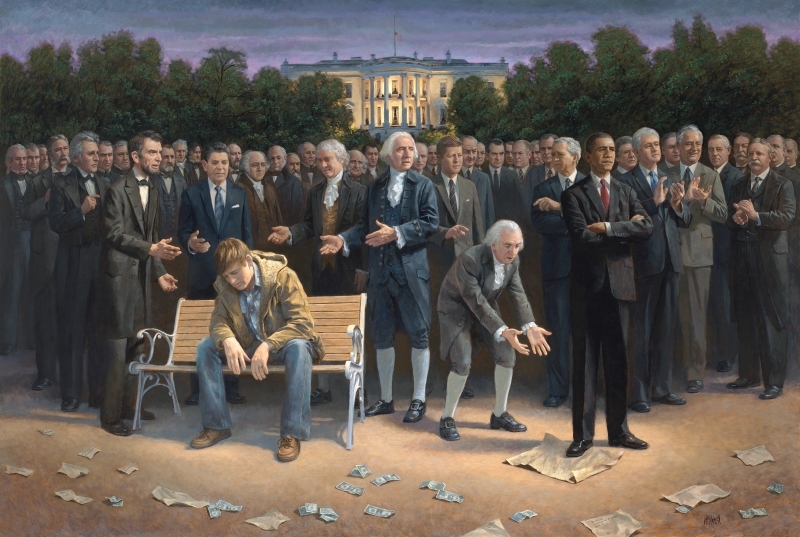 The fair was conducted to present itself as a celebration of the people and was developed for the average American. However, only large corporations could be involved because they were the only ones with enough money to buy the space at the Fair. Fairs in the past had focused on selling products, whereas this Fair wanted to focus on selling ideas. The changed theme had people skeptical and somewhat afraid of the change. A film called “The Middleton Family at the New York World’s Fair” produced in 1939 attempted to promote the Fair through the eyes of the Middleton family. The film was highly criticized and the New York Times described it as “an illusion of ‘tomorrow’s propaganda’.” It suggested that private corporations would only exist to serve the upper-class consumers. TIDE Magazine did a focus on the long term goals of the corporate “World of Tomorrow”. In their findings, they portrayed the idea that corporations did in fact produce gadgets and inventions that made American’s lives easier such as a typewriter for secretaries and the invention of the Kodak camera for personal use. However, TIDE concluded that there were disguised issues of labor and wages that corporations wanted to hide to Fair visitors. In order to portray the New Deal’s “consumer”, a Consumer Interests building was constructed at the Fair to allow consumer activists to sit with mainstream commercial interests. This didn’t last long and eventually the twenty-one consumer leaders resigned. The Consumer Interests building was renamed as the Fashion Building the following year at the Fair. This allowed the Fair to be inclusive for everyone to enjoy.